We’re celebrating all things pair-able, scoop-able, spreadable, & dip-able for this #PortsmouthBeerWeek event! 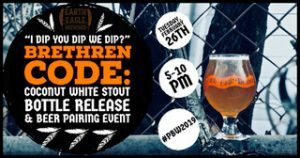 Join us for an appetizer pairing course AND the release of our rum barrel-aged coconut White Stout: BRETHREN CODE. Brethren Code is a White Stout brewed with coconut, coffee, & cacao, aged in rum barrels for 6 months and comes to a sneaky 8.5% ABV. This beer is being released in select 500 mL bottles for this event, with draught pours available & featured in our exclusive pairing flight. No reservations or tickets necessary.